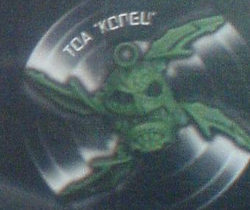 Kongu Spinner is a BIONICLE promotional set released in 2006. It was exclusive to Nesquik cereals in Mexico and Spain. It included a dark green Kongu spinner and two cardboard Piraka targets to throw it at.